The number of people who were apprehended or turned themselves in to Border Patrol agents near the U.S.-Mexico border last month dipped nearly 20 percent when compared to May, the U.S. Department of Homeland Security announced Thursday. The total number of apprehensions on the southwest border was 34,114 last month, down from 40,338 in May. That figure, which includes people who were apprehended between the ports of entry, also shows a slight decrease in the number of unaccompanied minors and family units that were caught. The decrease comes amid a firestorm over President Donald Trump's "zero tolerance" policy that led to the separation of thousands of immigrant children from their families. Trump's policy directed that anyone who crossed the border between ports of entry be criminally charged. Since parents and kids can't be kept in jail together, thousands of families were split up. Trump has since signed an executive order designed to end family separations, though many families have not yet been reunited. In a statement, Department of Homeland Security spokesperson Tyler Q. Houlton touted the “zero tolerance” and said the government would continue to enforce current immigration laws while Congress debates a change to the current system. The number of family units caught on the southern border dipped only slightly during the same time frame, from 9,485 to 9,449, while the number of unaccompanied children fell from to 6,388 to 5,115. The Border Patrol's Rio Grande Valley sector in Texas remained the busiest in the country, with about 14,700 apprehensions occurring there last month. That figure includes 5,420 family units and 2,576 unaccompanied minors. The second busiest was Tucson with 4,146 total apprehensions. That was followed by the El Paso sector (which includes New Mexico), which registered 3,572 total apprehensions, including 1,604 family units and 839 unaccompanied minors. 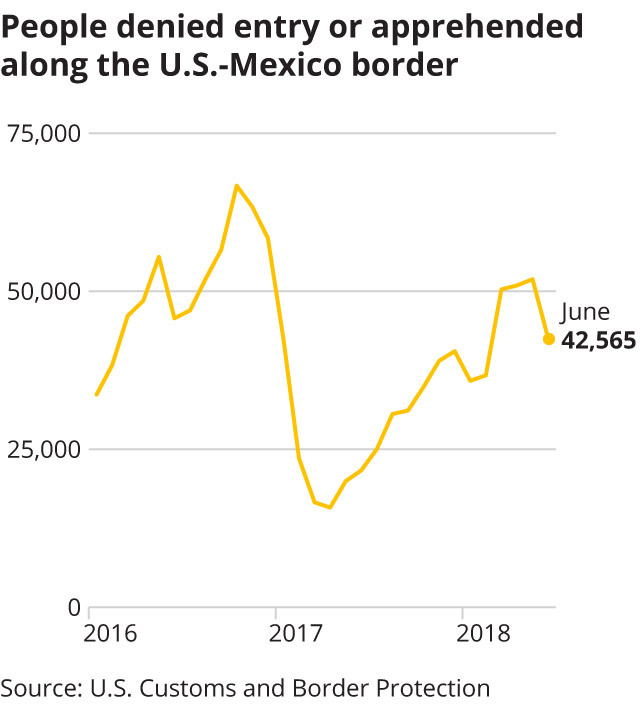 Though the DHS statement said the decline last month came after the administration’s “zero tolerance” policy, figures provided by DHS show that traffic has generally declined in the summer months over the last few years. Since the 2013 federal fiscal year, only 2017 saw an increase in traffic from May to June. And despite the drop in apprehensions over the last two months, government data shows that during the current fiscal year, from October to June, overall apprehensions of family units and unaccompanied minors increased when compared to the same time frame in during the 2017 fiscal year. From October 2016 to June 2017, about 33,000 unaccompanied minors and 63,400 family units were caught. From October 2017 thought last month, those figures were 37,450 and 68,650, respectively.